I love the blush pink with the black lace accent. So pretty – and perfect for February! First, major points for adorable packaging! I love lemongrass, so I was expecting this to be my new favorite lip balm, but the scent is pretty muted. That aside, the balm is very moisturizing and provides a nice sheen. More cute packaging! This lipstick is super moisturizing, creamy, and comfortable to wear. It has a satin finish with a micro-shimmer – this is the perfect lipstick for someone who wants to try a shimmery look on their lips but doesn’t want light-reflecting sparkles! Pacifica Beach Crystals Eyeshadow Palette – Estimated Value $10? This is normally the part in the review of a Pacifica makeup product where I say I love their ingredients, but I wish their products had more pigment. Not today! I was pleasantly surprised by the pigment throughout this palette! Beautiful shimmers, with good pigment! Great job, Pacifica! Pretty color, high shine creme, but didn’t last long without chipping. When they do send perfume, it’s a travel size spray, not a tiny vial. Verdict: This box has a value of about $65.39. I think that’s a great value, and I’m happy with the sizes of the items and the glam bag design this month, too! Not every item is a hit for me, but I still definitely came out ahead only paying $10 for this box! What do you think of the February Ipsy Glam Bag? What items did you get in your bag? I just cancelled my Ipsy bag after almost 2 years. Well, I didn’t go so far as cancelling, but I “paused” it for the next 6 months. I swore by Ipsy for a long time, but I’ve been getting similar items for so long that I felt it was time to leave. I’ve probably gotten 15 eyeshadow brushes in the last 2 years, and there is one coming in my March bag again. I’m also getting yet another dls baked highlighter…which I didn’t rate highly the last time I got one. I’ve NEVER gotten a fragrance from them. I’d actually really like that! Maybe in 6 months I’ll have used up all of the samples I’ve got stashed away and I’ll want to re-start. 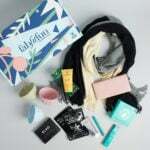 Or maybe I’ll go for Birchbox – my husband subscribes to Birchbox Man and LOVES it. In the meantime, I’m giving Fab Fit Fun a try. I was really let down with my Ipsy bag. I’m getting a lot of things in repeat shades so I going to cancel. I also get a lot of cheap Chinese made cosmetics too. I got the IT cosmetics concealer that’s way too light, the Unzipped liquid lipstick, the pacifica palette that you got but it must be a different batch because the pigmentation is zilch. dry shampoo to add to the heap of dry shampoos I don’t use, and more junk from Luna. My bags used be amazing but this year, so far stink. I’m getting cheap stuff I wouldn’t ever buy in real life the daily offer has gone downhill too. Amber, I have not heard from Linda about the perfume. I got the Blaq Meteor Shower and it sounded exciting by the instructions on the bag, but using it was a truly disgusting experience. This “scrub” was actually a dry-but-oily tar-like substance when I put it on my arm in the shower. I thought it must have gone bad, as it smelled bad, too. It left a large black smear on my skin, which would not budge with soap and water. I had to scrub it with a washcloth which was then stained and ruined. The black fallout globs that fell on my shower floor had to be scrubbed off with a Brillo pad. This is by far the worst-ever product I have ever received from Ipsy – or in an beauty sub box for that matter. It was simply a bad joke, and I want to warn everyone else about my experience with it. Very disappointing! I received this Blaq shower scrub too and Ipsy sent out an email saying some users were experiencing difficulty getting the scrub off. They recommended using coconut oil. It be cool if they could resend an item to replace this one since it was horrible all around. The IT concealer was white as a sheet on me, and i’m fairly pale…Purple highlighter was weird, and the APTO cream smelled like cheap motel soap. ew. I loved the Seraphine blush and klorane dry shampoo, but yeah it’s really hit and miss with ipsy. I appreciate the ipsy offers and snagged the dragon blood serum kit for a great price so at least I can pick stuff out that way. But dang, they need more quality control. I have been with them for 2 years, they should have an idea on my skin tone by now too smh. I was really happy with my ipsy box this month. I received the Bye bye undereye concealer, Luna baked highlighter, unzipped lip stain, Marc Anthony leave in conditioner, and the naked cosmetics eyeshadow. I will use each item so I am pleased. Ipsy sends out dozens of variations so you aren’t guaranteed to get any specific item! There are 20+ products every month and they try to customize your five products based on your profile and past reviews, but sometimes they miss the mark. Review your products and next month should be better! I told them I didn’t like bronze eyeshadow, so they SEND ME BRONZE EYESHADOW. I also got the Ofra Ipsy Unzipped lip color, which is a decent berry, but smells like coconut. I know, bonus! for many, but I am not fond of coconut. Also got the large contour brush; I don’t contour, but it will probably do for blush or powder or something. Always like getting tools. Rounding out the bag is the Bubble T lip balm, which smells okay and the 417 hand cream. Hand cream is good because it is bone-dry at work and I handle a lot of paper. This is my last Ipsy bag. I was never super-thrilled with them and if they’re going to imitate Sephora Play! and not go by my preferences (which Ipsy was exhaustive about), then I’m kicking them to the curb. I was really disappointed with IPSY and Boxy Charm this month. IPSY, gave me the APTO moisturizer which smells like rubber and burned the skin on my hands. OFRA lip matte lip in lavendar death(no, not the real name–just looks like it!) and a really pretty blush looking eye shadow. I appreciate both of these subs. But, the last 4 months have been downhill. Trade you for the bronze, which is also kind of pinky? I’m sorry Pink5, already passed it on to my niece. It’s okay, that was kind of a joke. May your niece enjoy the eyeshadow in good health. So the last bag was so bad for me, I opted to skip next month and may cancel altogether. I have product overload for one, and it just may be hard to match for a middle aged, dark toned African American woman. I get it, this sub may not be the best fit for me, but I’m very disappointed. I wonder if we got different batches of the Pacifica eye shadow. Mine did not swatch as well as yours did. Same. The colors were pretty, but the pigmentation was almost nonexistant. I even tried using my fingers & a makeup brush to see if it would make a difference. It didn’t. I felt the same way about the nail polish. It’s weird though, ipsy sent me that same brand of nail polish in a bright pink and I love it. I just couldn’t get that nail polish to work. Even with 3 coats ugh oh well! That’s why I love ipsy, I love trying new things and seeing what works and what doesn’t. I have received several Trust Fund polishes and even bought a few of the Ipsy deals, with their polish. I didn’t get it this month but makes me sad to hear this isn’t as good! I hope they didn’t change their formula & this is just a fluke! The color does look gorgeous. It’s so weird! I have other polishes from Trust Fund Beauty that I love! I’m assuming this one is just a fluke. I’m disgustingly into Trust Fund polishes (I only buy them through ipsy, but I check for deals on them more often than I should admit) and yeah, I can attest that they’re definitely not as consistent as some companies. Certain shades are AMAZING and others are thoroughly mediocre, either prone to chipping or just poor coverage. I’d imagine that it’s just this specific shade, since I had heard that commentary in the past! Great bag you got. I love my contents this month! The only thing we got the same is the Bubble T lip balm and mine is heavily scented but I don’t mind. I also received a foiling loose shadow, a berry copper blush that’s so pretty, the Luxie double ended brush, and the sparkling Meteor Shower body scrub. I don’t care for the actual bag the stuff came in, but I’ll pass it along to someone who likes it. I haven’t subscribed to Ipsy in over a year but that perfume is my favorite!! I buy the rollerballs because the perfume itself is above my budget. There’s a site called fragrance net (Google it it’ll come up) that sells perfume with huge discounts, I bought a few things and theyre legit. I prob sound like a bot but idc, I’m in love with the site lol. They also have lots of coupons but spam your email with em. I was pretty happy with my box, I got three of the items you did (the lip balm, polish and the eye palette. Unfortunately my Trestique eyeliner showed up broken, but I’m hoping IpsyCare helps me out, as I was actually pretty excited about trying that one out. And I agree about the polish, the formula was really off, which was so sad because I really loved that color. I’m definitely going to keep subbing to Ipsy, so far it’s been the best value though. I love Pacifica and was happy to get the eyeshadows. I tried a couple of the shades yesterday and was pleased with the performance. Pluss they aren’t neutrals, which is a nice change. I’ve gotten so many browns and muted shades in the past from ipsy. I also got the lip balm but I think it smells artificial, like perfume (sure enough, one of the ingredients is perfume) so I don’t know if I’ll use it. It’s too bad because the packaging is really cute. My other items were the trust fund polish, a very small eyeliner (tresique I think), and a double ended brush. I haven’t used any of them yet. Overall, I’m happy with my bag. I think I might email and opt out of brushes though. I get one almost every month and rarely end up using them. I love ipsy, and I love that they did a body positive theme that had a lot of diversity and was pretty inclusive — but it missed two big areas: no plus size woman, and no one between 38 and 75. The 75 year old woman really rocked, but there was no one like me, over 40 and over size 12 or so. I know I’m not the only ipster of these demographics. The average size of American women is 12, and well over half of American women are size 12 or over. I’ve written to them, and I hope it’s something they’ll consider for the future. But on to my items! I get two bags, because I love ipsy that much. So many of this month’s products seem great! I put different answers on my two profiles to get different products. Bag #1 – original ETA was today (Thursday), so I hope I’ll get it tomorrow. 5. Estate highlighter – yaaaasss it looks gorgeous! I’m so chuffed! 5. Meteor Shower! This sounds amazing, and if it’s as awesome as I hope, I’ll be swapping all over the place to collect more! I’m still waiting for mine to show up. I know the weather’s been bad, but I’m kind of annoyed with the the bags arriving later than predicted. It’s happened twice in less than six months. I’m kind of two minds about this. If I get another bronze eyeshadow I’m canceling. I told them with the first one I got that bronze doesn’t flatter me. Great bag! I got my best bag ever! They had the best stuff this month. I was so happy. Having said that they had messed up somiof mine and I was allowed to pick one product and I picked Sand & sky clay mask. They didn’t include it. But I was still happy with what I got. I used ipsy points and received Bridgewater candle lotion. It’s a nice size tube! It’s hard for me to find a good lip balm so I was pleasantly surprised with how well this one is working for me. I was also impressed with the pigment of the shadows because I had gotten that brand of shadow in my second or third Ipsy bag and I didn’t like it at all. The shades are also really pretty and so is the case. I used it for my Valentine’s date night and and loved the look I created with it. I got the polish too but haven’t tried it. My BFF did tell me this morning about the chipping. Did Trust Fund change the formula? I got the mini Trestique pencil too. It pairs well with the palette. This is my second anniversary with Ipsy and I absolutely loved my bag. They nailed my preferences. And I’m happy they went back to a Valentine’s themed bag. Good base coat and top coat will take care of the chipping. Wow, major box envy. I’m grateful I received the It Cosmetics, but I’m liking all of this! By far the WORST Ipsy box I’ve ever received. I didn’t get anything that you received. I got a horrible ORANGE blush, seriously, ORANGE. The only good thing in it was the IT concealer. It’s great. I’ve already threatened if I get one more black liquid eyeliner…had to completely remove eyeliner from profile. Also, what’s up with every eyeshadow being shimmery? Too old for that. I received the same bag and loved it. Blaq Meteor shower which I’m scared to try; have seen a couple people say it’s horrible and turns to tar. i have almost the same bag, but instead of the eyeshadow i got a double sided mascara, which isn’t bad 🙂 i love the liquid lip, have you tried it? it’s very comfortable. I received the same exact bag as Julie. It is okay. I do like the Ofra liquid lip. But I would have loved getting the same bag as Liz. My bag was ok but the one reviewed was great!! I still love Ipsy! Definitely my favorite $10 subscription!! – bang beauty blush in smoked peach. The eyeliner pencil tricked me. I thought it came without a cap but the cap just looked like the eyeliner. Tricky. I also got the perfume and lip balm. I have been getting lucky with perfume December I got a full size define me perfume. My other items were the Ofra lipstick, mellow eyeliner and Beaute Basics eye shadow in Lavish. I hope I get Pacifica in one of my future bags they sent it twice last time. Same here! I wanted the Pacifica so bad. And I keep asking for purple shadow, but they always send me bronze instead. Same here, that’s why I canceled. Dana what eyeshadow preferences did you opt in on your quiz? you should unselect Neutrals all together so you never receive bronzy shades. Ans always leave reviews on the products. If you get a product in a shade you dont like, put a low heart rating review on the question that asks you if you likes the shade. The ipsy algorithm takes your feedback from the reviews into account. If you give me your email address, l’ll send you the perfume. Amber, I saw your comment, but I will wait for Linda to reply. Otherwise, I would be happy to send it to you. I don’t wear perfume. I just have to remember to keep checking this space! I have not heard back from the other gal.